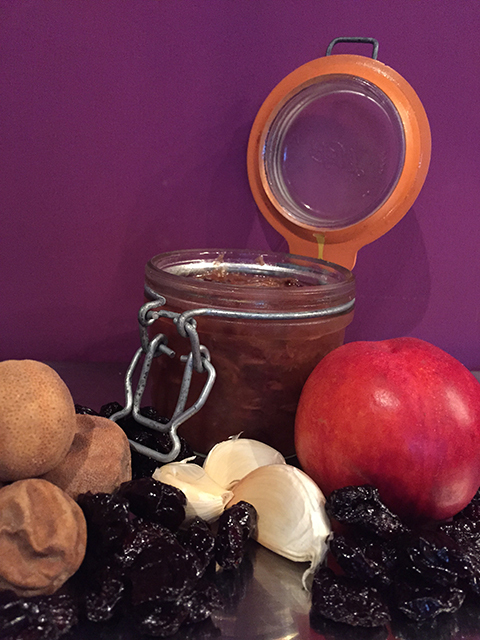 Nectarine, garlic, sour cherry and lime chutney. Home made chutneys are always far superior to shop bought ones and you can once you have made a few have an almost endless variety of choices at hand using ingredients in your cupboard. We had some sour cherries and whole Iranian limes leftover from a middle eastern dinner so we mixed these up with some nectarines and lots of garlic and this delicious chutney was made. This is a very flexible recipe, you can use peaches or plums, change the cherries for raisins or sultanas and if you're not a fan of garlic then swop for a chopped onion. Whatever you choose a chutney is a great accompaniment to cheeses and cold meats.